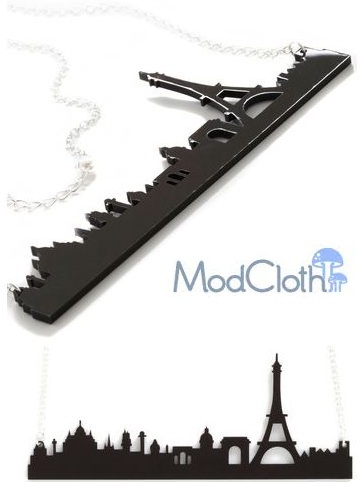 Quickie Darling Deal & Steal: ModCloth Can Take You To Paris (With A Necklace)! I’ve been spending a lot of time lately scoping out other bloggers, getting to know them, getting inspired, getting to learn more abot how I can improve Style Darling. In my time clicking & clicking, I’ve been noticing a trend of statement necklaces (it’s not like I’m just figuring this out) that I can’t stop thinking about. Of course, I’ve mentioned countless times that my budget is so super tight, it’s practically suffocating, but there’s no harm in looking. While searching on ModCloth, one of my favorite vintage-inspired sites, I found the Cities Oui Love Necklace ($29.99). This unique piece brings the luxury of the Parisian skyline right to your wardrobe. We all love a fun graphic tee, splashed with some grafitti-inspired French saying, but in blending the always fashionable amour of France with the trend of a statement necklace makes for the perfect balance of experimentation & forward thinking. Let this hang over a silk camisole & skinny jeans, or turn some heads by pairing it with an all-white sheath dress. The black will stand out & you’ll be called a modern day Audrey Hepburn. I should also mention that even though the necklace costs the total of about five necklaces that you could buy @Forever 21, it’s always a smart investment to find pieces unique to your personality & style, setting you apart from the other Style Darlings ruling the world. Happy Styling! This entry was posted in Quickie Darling Deal & Steal, Style Darling Daily and tagged Cities Oui Love necklace, Eiffel Tower, ModCloth, Paris, statement necklace. Bookmark the permalink. ← Runway Rundown: A Ravishing 2013 Resort Collection By Carlos Miele!